A view in Chugach State Park along Turnagain Arm south of Anchorage, Alaska. Some rugged rock along there. A favorite place for hikes and picnics, and sheep, mountain goats (sometimes), moose and bears. The image was drawn on a white marble lithograph stone, the ochre background color was printed from an aluminum litho plate. 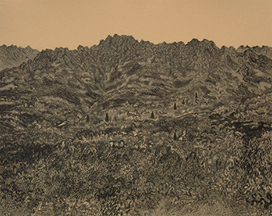 All work, and editioning, was done at the Visual Arts Center of Alaska in 1978, during which time I was employed as Printmaking Studio Manager. I had earlier completed a large painting -- about 4 x 5 feet -- of this same view. At the time, I often worked from photos in the comfort of heated indoor studio, instead of outdoors on location, as I endure nowadays. Edition prints available, easy delivery in shipping tube. Optional mat and frame. Please inquire. Other fine prints are available, see Prints. The appeal of this tiny work is its strong, unlabored, quickly executed 'fresh' brushwork in muted, subtle color. Painted at sundown, just before dark. This is one of 24 paintings currently in the St. Johns River Series, and was painted on location west of Titusville, Florida. 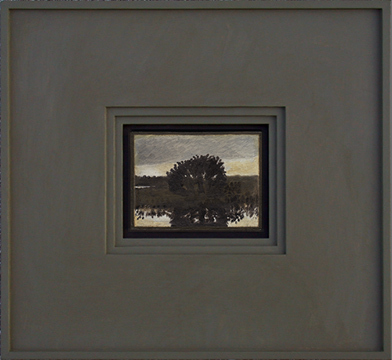 The St. Johns series was initiated while working nearby for nine months on a big project painting, Tootoosahatchee. Small paintings — quick, short term works — were convenient for early mornings and late evenings before or after working on 'Tootoo.' Thus, the St. Johns River Series came to be. From time to time, another painting is added to the series. FRAME. The frame is constructed of solid poplar, crafted for me by an exceptionally fine woodworker, Doug Trythall of Palm Bay FL. All the finishing was done by me. Frame dimensions: 11 x 12 x 1 3/8 inches. 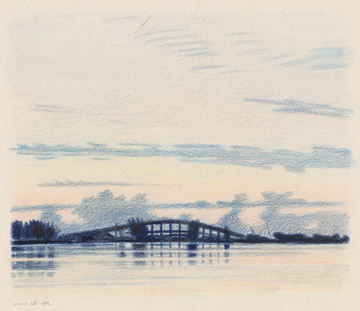 Sunrise, June 23, 1983, Indian River Lagoon, Melbourne, Florida. The 2nd high rise span of the Melbourne Causeway was under construction. There are two construction cranes at the right (east) end of the causeway arch. The image is centered on a full 8x5 x 11 sheet of paper, Southworth Parchment Deed paper, 100% cotton. 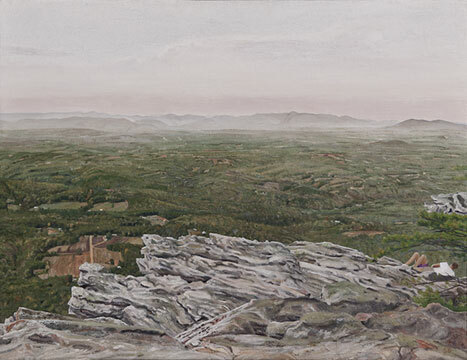 Painted from life at Hanging Rock State Park in the Sauratown Mountains north of Winston Salem. The view is to the northwest. Smog lies over the Blue Ridge Mountains in the hazy distance. Mountains on the right are in Virginia. Hanging Rock is a popular state park, and visitors clamber among the rocks to enjoy the fabulous view. Partially hidden on the right, a pair of young lovers enjoy the view, and each other. In the rolling landscape below, a field of corn has recently been harvested, and fall colors are beginning to appear. The Sauratown Mountains are named for Saura or "Saraw" tribe of native Americans who once lived in this area. The mountains are composed of ancient quartzite outcroppings said to be 250-500 million years old. Almost all of the work on this painting was done on-location at the top of the mountain, which necessitated daily climbs up the steep (very steep!) slope for about two weeks, as I remember it. Mercifully, the climbs did get easier, and I timed my climbs to improve my pace as my legs got better conditioned. Refinements on the painting were accomplished in my stepvan mobile studio while I camped in the region nearby. The following year more refinement work was done in Florida. Final work was done eight years later in Florida, in 1999. The above works are available for purchase. PAYMENTS: Our secure online easy-to-use service provider is WePay, which accepts MasterCard, Visa, Amex and other cards. Optionally, you may pay be check or money order. PREVIEW OF ARTWORK We can arrange for preview of actual artworks before you make a purchase. Please inquire. BILLING: Following agreement to purchase made via email or phone, we will bill you, directing you to WePay for secure online payment.